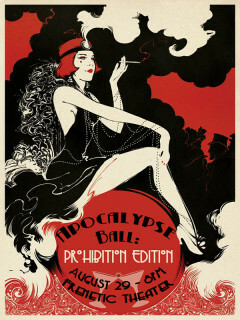 FrenetiCore presents the 4th annual Apocalypse Ball: Prohibition Edition, a night of performances, hooch, hors d'oeuvres and forbidden fun, all in the name of supporting the Houston Fringe Festival, a five-day performance feast like no other. Have your fortune told, do the charleston on the dance floor, gamble your cares away and drink up. Enjoy fire dance performance by ChinaCat Dance on the patio and FrenetiCore Dance’s Film Noir, celebrating hard-boiled detectives, femme fatales, danger, love and murder. $25 General Admission and $60 VIP in advance; $30 General Admission and $65 VIP at the door.